I don’t have a Kindle device, but I’ve recently been learning about the advantages of using the Kindle apps for PC, Mac, and iPod Touch. A great weakness of the Kindle device is that it doesn’t display color, so color pictures on the Kindle apps open up a whole new world. All Kindle books have a free sample that can be downloaded to the device and to the apps. I’ve downloaded samples for several books that seemed likely to have pictures, and have found that the sample is often from a portion of the book that has only text. I’ve found some cases, however, in which the sample does have pictures, in the list below. To look at these free samples, sign in with an Amazon account, download the appropriate Kindle app, follow the links below, and view samples. The Poky Little Puppy – There are many childrens books with color pictures. Since the books are short, the samples generally only contain a few pages, as in this book. Posted in Color, eBooks, Kindle, PicsYes, Pictures, Uncategorized. An earlier article, Color Pictures in Google Books, discussed a few examples of color pictures in full-view books in GBS. Below are more examples in the areas of botany, medical botany, and dermatology. 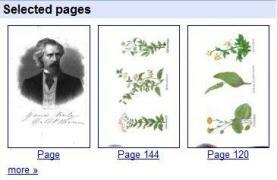 If you know of other areas that have books in Google Books with color pictures, please send comments. Posted in Color, Flickr, Google Book Search, PicsNo, Pictures, Uncategorized. 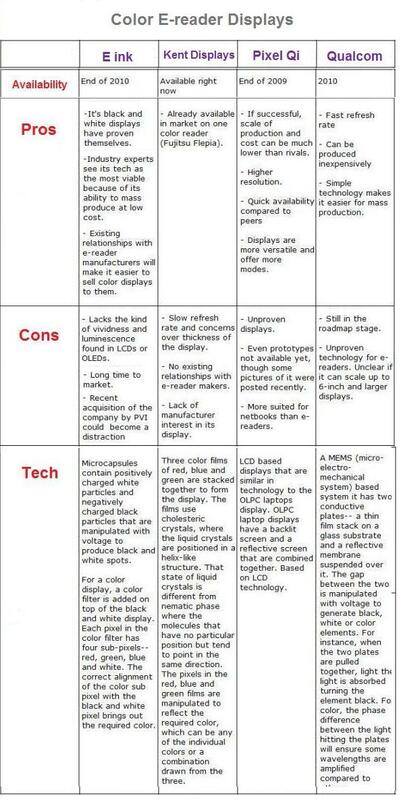 A recent Wired article (Why E-Books Are Stuck in a Black-and-White World) has a good chart comparing four leading E-reader displays (E-Ink, Kent Displays, Pixel Qi, and Qualcomm). The chart appears far down in the article, though, and I suspect it was missed by many readers, so to make it more visible I’m republishing a slightly massaged, smaller version below. Posted in Color, eBooks, PicsYes, Uncategorized. A notable feature of the KIndle iPhone app that was announced today is that it has color, unlike Amazon’s Kindle device. The most complete comments I’ve found on this are at CNET.com, written by Nicole Lee (whose interest in comic books gives her good reason to look for color!) Her article is especially valuable because it has a good comparison of screenshots on the iPhone and the Kindle. I’m showing this prominently because it appears at the bottom of the CNET story, and I suspect may be missed by lots of folks. Lee’s comments on color are excerpted below the screenshots. … there is one potential advantage the iPhone has over the Kindle, and that is this: Color. Why would you want color in an ebook? Why, for comics, of course. I’m a big comic book fan, so I went looking for comics in the Amazon Kindle Store to see how it would look on the new Kindle 2 with its 16 shades of gray. There aren’t a lot of choices out there, so I just downloaded a few samples to check them out. The results are not that great, sad to say. Each comic page is considered an image, so it’s a little slower to download. I was fine with the gray shading, but the comic format does not quite fit the size of the Kindle 2’s screen. Smaller format books like manga digests look a little better however. Still, navigating the pages is a pain. There’s no way to zoom in and out of panels, and if I wanted to enlarge the images to full-size, I had to do so for each page. Plus word balloons are almost impossible to read since I can’t zoom in. I downloaded those same comic samples to the Kindle application on the iPhone. I still couldn’t zoom in, and it’s still hard to read the word balloons. But I was awed and amazed that they arrived in full-blown color. Yes, I couldn’t read any of them, but it gave me a small glimmer of hope that maybe some day there’ll be a way. Until then, I guess I’ll have to live with the individually-sold iVerse comic applications. It’s interesting, of course, that the first format that shows the value of color e-books is comic books — But, the implications are far-ranging for illustrated books in general, such as medical and science textbooks in which illustrations have an important place. 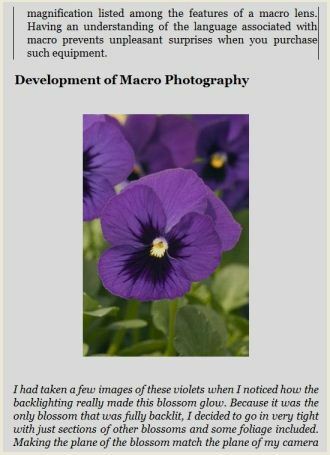 Posted in Color, eBooks, iPhone/iPod Touch, Kindle, PicsYes, Uncategorized. … The first is Samsung hitting the pedal hard on OLED screen manufacturing. … The second development has been Hewlett-Packard demonstrating color eInk screens. … The third piece of this puzzle: Amtek Rumored to Show Slate Netbook at CES 2009. … The Wild Card in all this? … Pixel Qi, which brags it has revolutionary screens that will basically run on electrons by osmosis instead of the greedy sip-sip-sip of current technology. Sad to say, this is one of Mike’s last blog postings — His incisive comments on eBooks will be missed. … Nearly all non-fiction books cry out for far more illustration than they contain, but the costs of adding pictures and charts (especially color pictures and charts) are prohibitive. That’s why you see so many non-fiction books with all the photos bunched up into a couple of glossy-page sections in the center. It’s the only cheap(ish) way to get the job done. Color E-Ink will change that forever. Nearly all non-fiction books cry out for far more illustration than they contain, but the costs of adding pictures and charts (especially color pictures and charts) are prohibitive. That’s why you see so many non-fiction books with all the photos bunched up into a couple of glossy-page sections in the center. It’s the only cheap(ish) way to get the job done. 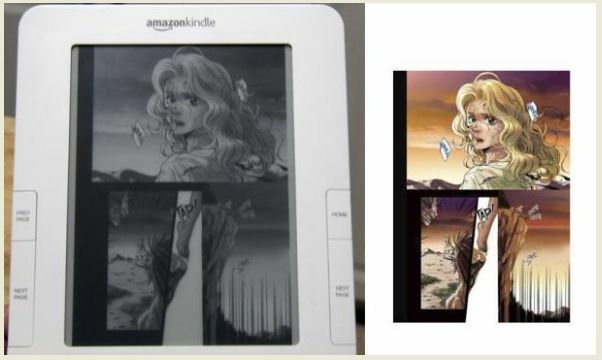 Color E-Ink will change that forever. Scientific and medical books, which make heavy use of color illustrations, especially stand to benefit from the advent of color eBooks, maybe lowering the prices, which can break a student’s budget for print textbooks. Posted in Color, eBooks, PicsNo, Pictures, Uncategorized. Kalev Leetaru (Univ Illinois) recently published a lengthy and interesting article comparing Google Books and the Open Content Alliance. 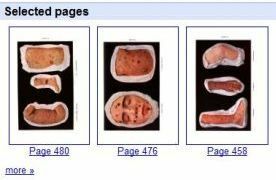 It’s especially interesting because it brings together a good description of many nitty-gritty details of Google Books that are not easy to track down. I’m excerpting a few passages on the use of color and PDF format in Google Books. Color in Google Books – I have the impression, as Leetaru says, that when Google first started scanning books they didn’t scan in color — They do now though, at least in some cases. Since the majority of out–of–copyright books do not have color photographs or other substantial color information, Google decided early on that it would be acceptable to trade color information for spatial resolution. Google’s use of bitonal imagery and its interactive online viewing client significantly decrease the computing resources required to view its material. … Google Book’s bitonal page images, on the other hand, render nearly instantly, permitting realtime interactive exploration of works. Use of PDF in Google Books – It’s interesting that Leetaru says the Google Books view “mimics the PDF Acrobat viewer.” Until recently, I avoided using the “Download PDF” button link in Google Books, thinking that it was mainly for downloading to print, and that the PDF view would take a long time to load. But I’m finding that it loads quickly, and provides a fairly usable interface that is in fact reminiscent of the Google Books view, as Leetaru suggests. Google realized it was necessary to use different compression algorithms for text and image regions and package them in some sort of container file format that would allow them to be combined and layered appropriately. It quickly settled on the PDF format for its flexibility, near ubiquitous support, and its adherence to accepted compression standards (JBIG2, JPEG2000). While many digital library systems either do not permit online viewing of digitized works, or force the user to view the book a single page at a time (called flipbook viewing), Google has developed an innovative online viewing application. Designed to work entirely within the Web browser, the Google viewing interface mimics the experience of viewing an Adobe Acrobat PDF file. While most services take advantage of the linearized PDF format, Google made a conscious decision to avoid it. Linearized PDFs use a special data layout to allow the first page of the file to be loaded immediately for viewing … Google found several shortcomings with this format [noting that] the majority of PDF downloads are from users wanting to view the entire work offline or print it [and that] for these users, linearized PDFs provide no benefit. See Leetaru’s extensively-referenced article for many other useful details. Posted in Color, Google Book Search, PDF, PicsNo, Uncategorized. 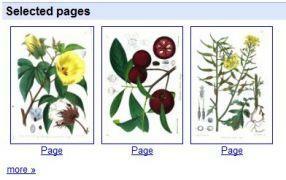 Color pictures in full-view books in Google Books are generally not common. This is not surprising, since color pictures in books generally before the pre-copyright date (1923) were uncommon. Searches in Google Books for likely subjects — museum, sculpture, french painting, history — do find many books with pictures, but they are almost all black and white. An exception to the general lack of colored illustrations in older books is in the areas of botany and dermatology, two subjects in which I have a particular interest. In these subjects there were many books published in the 19th century, especially in Europe, with excellent color illustrations. 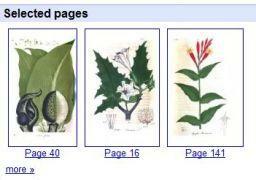 A few examples from Google Books About This Book: Selected Pages are shown here. Posted in Color, Google Book Search, PicsYes, Pictures, Uncategorized.